You’re probably familiar with some of the breathtaking images captured by the Hubble Space Telescope. What you might not know, is how those images get from the satellite to our computer screens. Not only does the data need to travel from space to Earth, it needs to be edited and manipulated into a color image that our eyes can process. Not all of the information displayed in these color photos reflects light in the visible spectrum. This isn’t done just to make a pretty picture but to show the interaction of cosmic phenomenon that can only be seen in non-visible wavelengths, such as ultra-violet and near infrared. NASA and the ESA released a behind the scenes video breaking down how artists work with astronomers and physicists to come up with the animations and images. This is especially important for events and objects that are known to exist but can’t be seen. This may seem like an impossible task. Gravitational waves are a good example. We have measured their existence and we have a pretty solid understanding of how and why they occur. Artists can depict the collision of two neutron stars and the invisible ripples that move through the Universe; but they also need to show the passage of time to get the full picture and portray to a viewer that that this plays a significant role in the creation of gravitational waves. Like astronomy, the artist must consider that space and time are intrinsically linked. You can’t have one without the other and that can be a difficult factor to display in an animation. Planets are also tricky. 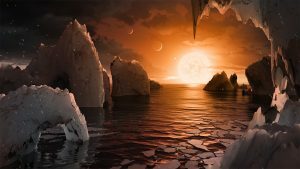 When the TRAPPIST system was discovered with three planets orbiting in the habitable zone of their star, artist didn’t just make up a fanciful rendering of an alien planet. TRAPPIST is about 40 light years from Earth, a distance of 235 trillion miles. We cannot see these planets with any detail. Estimating their size, mass and densities gives researchers a baseline idea of the planet’s composition. From there, artists work to create an impression of the planets, even making landscapes to give people a feel for what setting foot on the planet might look like. Interactive 3D models, travel posters, comparison charts and orbit maps are just a few of the illustrations and videos that artists, scientists and researchers collaborate on to bring these far-off, alien worlds to life. This entry was posted in The Geospatial Times and tagged Hubble, Out of This World, The Geospatial Times, Tips & Tech by Apollo Mapping. Bookmark the permalink.